Among many things, the Alliance of American Football wants to present fringe NFL players with another chance to prove they belong on a 53-man roster, and one former Redskins linebacker did just that on Saturday night. Terence Garvin played with the Burgundy and Gold in 2016, getting action in all 16 games, mostly as a special teamer. At that point, the Redskins had Will Compton, Mason Foster, Su'a Cravens and Martrell Spaight ahead of Garvin at inside linebacker, and despite being popular in the locker room for a goofy sense of humor, there weren't many snaps for Garvin with the defense. 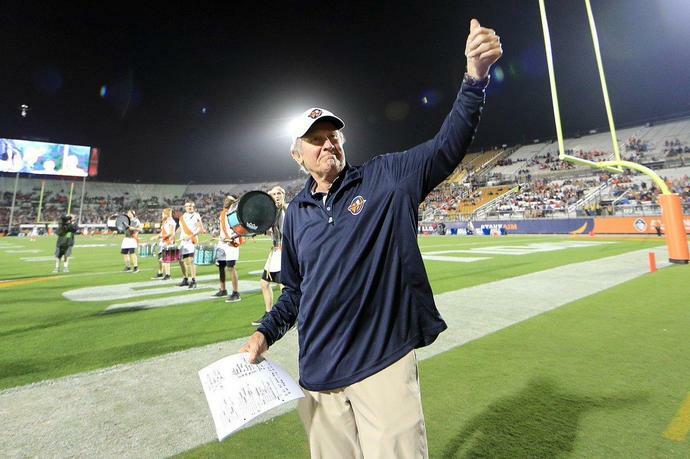 Fast forward a few seasons, and Garvin looked great in the first-ever win for the Orlando Apollos, a dominant 40-6 victory over the Atlanta Legends. Garvin grew up in Baltimore and played his college ball at West Virginia. He also played with the Steelers, Seahawks and Niners before landing in the AAF. He logged two interceptions in the season opener, including the pick-6 above. Another former Redskin also returned to the football field Saturday night, only this time it was the sideline. Steve Spurrier found incredible success coaching on the college level at University of Florida and later at the Univeristy of South Carolina. His two-year stint coaching the Redskins is quite memorable, but not for winning. In two years with Washington, Spurrier went 12-20 and famously called in his resignation from a golf course. Spurrier never seemed to understand that in the NFL, he needed more pass blockers than his famous Fun-N-Gun system would allow, or that Danny Wuerfel was not an NFL-caliber QB. He did deliver some tremendous one-liners though. '5-11, not very good," might be the definitive line of the Spurrier era in Washington. Well, with the Apollos, Spurrier looked all the way back. His offense ran an up-tempo, pass-heavy attack that posted 40 points. Spurrier called a deep pass on the first play of the game and got a touchdown on a double reverse throwback option. For Redskins fans, the play might bring back memories from the epic preseason game played in Osaka in 2002. It was one game, but it was fun. Spurrier seemed to be in his element, and Garvin showed why he stuck around the NFL for six seasons. If Redskins fans are looking for an AAF squad to root for, Orlando might be a good place to start.